Rajasthan Public Service Commission (RPSC), Ajmer today cancelled the Rajasthan Administrative Services (RAS) Pre Examination 2013 held in October 2014 for which result was declared on 11th June 2014 after paper leakage was detected during exam in investigation. 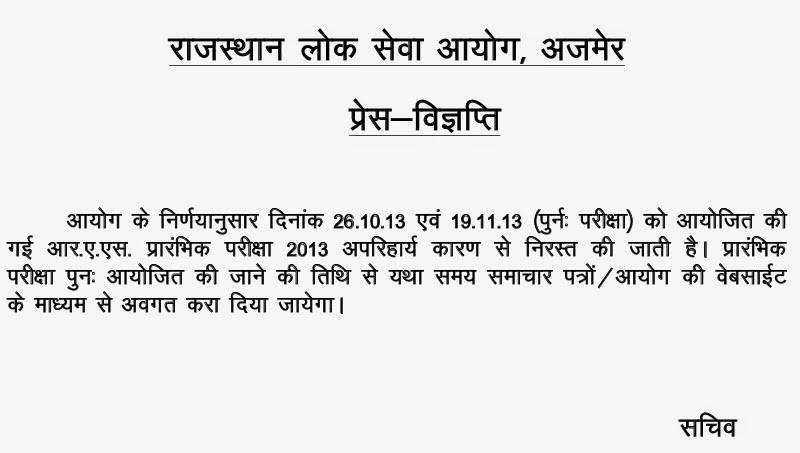 A fresh examination will be conducted within two months as per RPSC, Ajmer press release. For more details check detailed Press Note for RAS (Pre.) exam-2013. This is major setback for selected candidates who started preparation of RAS Mains 2013 and candidates who is waiting for RAS Pre 2014 which will miss the RPSC Calendar.